The Beacon Puddle Sponge is one of the best ways to remove puddled water off your infield skin. That’s because it will not disturb the infield soil or topdressing material as you set the sponge over a puddle to soak up the excess water. 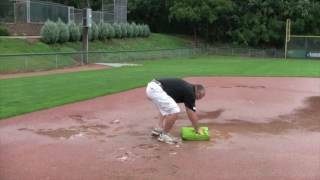 Using brooms and roller squeegees on your infield skin to push water off is a BIG NO-NO! As that water is pushed around it picks up infield soil and topdressing, which helps to develop low spots, and will drop that material off at the edge of the skin in the grass which quickly contributes to building lips. Those lips further impede water movement off the infield skin surface, often making puddling issues chronic. With the Puddle Sponge, just depress the sponge on the puddle and allow it to wick-up the standing water. Then take the sponge to the outfield grass and wring it out by rolling the sponge up while it is laying on the grass. You can then return to the infield skin as many times as needed to further wick-up and remove the remainder of the puddled water (watch the video below). Here is a QUICK TIP about the Beacon Puddle Sponge: When your Puddle Sponge is brand-new and right out-of-the-box, there will be some soap embedded in the sponge that is left from the production of the sponge. It is absolutely normal for the sponge to foam heavily the first several times it is loaded with water. This foam will not hurt your turfgrass. After 3 to 5 dunks in water, the bulk of the frothing will go away and the sponge will actually absorb water even easier. It’s a thirsty sponge! Use the handy loop in the cover to hang the sponge out to dry between uses.